Millennials: Are they having an effect on the commercial real estate market in Augusta? They are young, they are productive, and they are all over the headlines these days. When you think of the modern office environment, you think of Millennials. They comprise nearly 40 percent of the American workforce and our local economy is seeing this segment growing rapidly. Their habits are affecting and changing the way we all approach life, work, and play. We set out to explore how these trends may be having an effect on commercial real estate in Augusta, specifically downtown. Charlie Wall is a local business owner. His company is LOOP Recruiting and he spends a good bit of time recruiting and hiring from this demographic. Loop Recruiting watches a number of key characteristics among Millennials, which also provide insight into the changes that are being seen in commercial real estate. Millennials tend to be social, collaborative, and community oriented. “This could explain the increase in shared office spaces, open-concept designs, and mixed-use blocks of real estate where employees can live, work, eat, and socialize” Wall says. Parker Dye is a broker with Jordan Trotter Commercial Real Estate. He says that millennials are driving the market. “They are interested in supporting local businesses and they want to be a part of the same community they are supporting,” Dye says. Millennials want access to technology 24/7 and want to be able to handle their personal and business matters digitally. They are also able to communicate and problem-solve electronically. They want their workspaces to be composed of “smart spaces”. That means constant access to Wi-Fi, USB ports, and outlets for computers, tablets, and cell phones. A big question for those in commercial real estate and development today is whether office, restaurant, and living spaces are created differently with millennials in mind. The answer is an overwhelming yes! Alex Wier of Wier/Stewart explains that the younger workforce is pushing companies of all sizes toward open space plans. “A strong, open and friendly culture is super important to employee retention and that is fostered in spaces that support interaction and collaboration,” Wier says. He says there’s a demand for the renovation and repurposing of existing properties versus creating all new structures. Wier believes people are beginning to appreciate history and character over pure functionality. Millennials tend to look for employment where they have opportunities more than just sitting in an office or cube all day with a 30 minute lunch break. Many businesses are starting to incorporate spaces for rest and relaxation into the work environment. One of several local examples is UNISYS in the Discovery Plaza building Downtown. 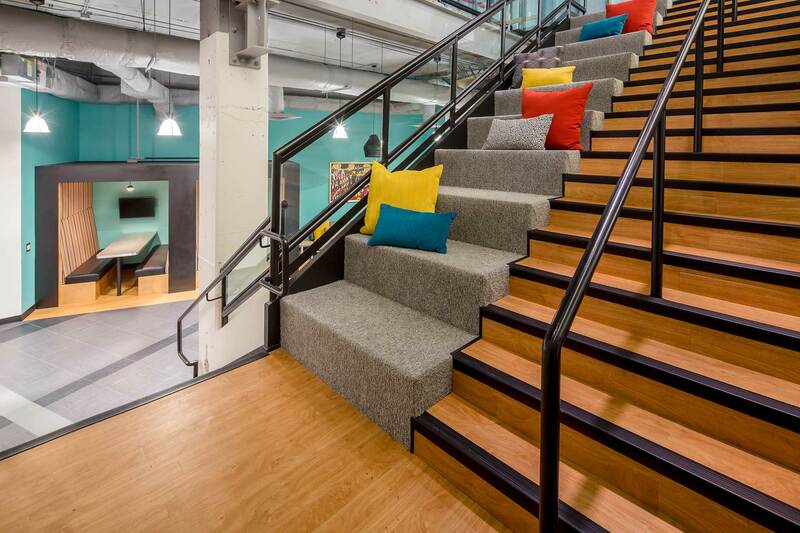 Their plan has added a “relaxation stairwell” with over-sized pillows that offers a social atmosphere adding wellness and balance to the workplace. It’s a design plan aimed at providing a way to break up the day. Another hot button with Millennials today is being eco-friendly. Millennials enjoy the urban walkability of their workplace. They are more interested in the environment than any of their generational predecessors. Charlie Wall says this likely explains the increased demand for walkable urban areas, bike racks, public transportation, and eco-friendly company cultures and practices. From alternative work spaces to being eco-friendly to being socially collaborative and technologically savvy, it looks like Millennials may have this whole work, play, live, thing figured out. Maybe the rest of us need to stop, take notes (on our phones or ipads) and get with it!